Read a story about a magical window which when you open lets you wander the world & makes you super-efficient, or super-inefficient! Yes, I’m talking about a website. Website designers all over the world are coming up with newer ways to solve your daily challenges. Web developers are both artists and engineers because they code to design web pages, that not only have hues of the varied colours but also empower you at a jaw-dropping level. Yes! And to understand this, we do not really have to time-travel. Just think how things were 20 years back: people couldn’t connect with their long-lost friends and bank transactions were a tedious & time taking affair as people had to visit the bank to deposit or transfer money. When you wanted to buy a book, you had to visit the bookstore – and if the bookstore didn’t have the book, you had to wait for weeks to get it. But today, there is a website (and app) for almost everything. You do not have to go and stand in line if you want to book a train ticket. Your dad doesn’t really have to go to the bank every time you ask him for money. You can buy books (I hope that’s what you spend most of your money on! :P) online. Your mom can buy groceries without having to go to market. And most importantly, it has made your life a lot easier; with Google or Wikipedia around, you can do your assignments/projects in no time! Yes! What’s interesting even more is that the number of jobs in web design and development has been ever-rising. You would also be happy to know freshers are offered a salary of 30,000 – 40,000 per month! Now that you know how website developers can make cool websites and there are ample employment opportunities with good pay for them, you may want to consider learning the skill. Okay! But how difficult it is to learn web development? Backend development: This is how your website works. Here you learn PHP (or any other scripting language such as Python, Java, Ruby, etc) and database languages (MySQL, MongoDB, NoSQL, etc). Another interesting fact is that even if you master one of the parts (frontend or backend), you would have ample job opportunities. 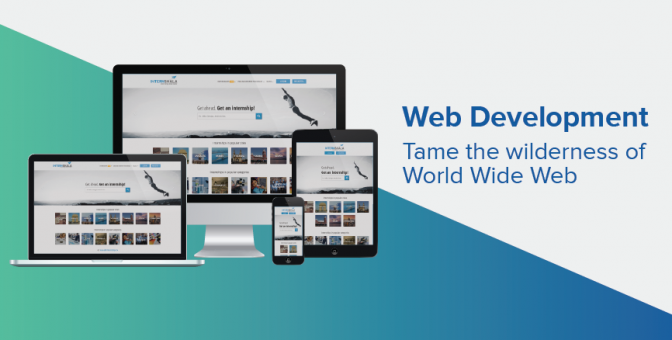 Excited to create a website? So are we.. to tell you about the amazing offer that we have for you! Register for Internshala’s Web Development training and learn the ropes of building a website with an additional discount of 10%.